This article first appeared on East Niagara Post on June 16, 2015. It is repeated here as I work to put all my book reviews in one place. They will be posted on Thursdays or Fridays and only be altered from the original in that I will add publisher information and pages. Hopefully, by revisiting these reviews, other people might find a book they'd like to pick up for their own enjoyment. This week’s review is going to take on an ugly truth about our country. Despite our supposed “progressiveness,” we are still a racist country. In The Color of Justice by Ace Collins, we get to observe two incidents of blatant racism separated by half a century. Although this is fiction, the two cases detailed in this book could very easily come from the front pages of newspapers of the day. In Justice, Mississippi in 1964, a black man is accused of killing a white girl whose body was discovered at the local Inspiration Point. Lawyer Coop Lindsay agrees to take the case after the boy’s mother pleads with him to do so. In a town where the rich white citizens make the rules to keep the poor black citizens at bay, taking on this case means Lindsay will be ostracized in his community. Despite the threats to him and his family, his conscience needs to see that the accused gets the justice he deserves. Lindsay suddenly has no friends in his hometown. People go out of their way to avoid him, calling him names, spitting on him, and burning a cross on his lawn. The citizens of the tiny town wonder how he could go against “his people” and throw his lot in with “them.” Obviously, in their opinion, the alleged murderer is an animal who needs to be put down. At the end of the trial, Lindsay and his client, Calvin, disappear. No one knows what has happened to the two men. Fifty years later, Lindsay’s grandson comes to Justice to see if he can discover what happened to his grandfather after the conclusion of the trial. Clark Cooper Lindsay, also an attorney, arrives in town on the cusp of yet another trial that threatens to tear the community apart. In 2014, a white man is accused of violence against a black member of the community. In a reversal of roles from 1964, the black community screams for justice, stating that white privilege will let the alleged culprit walk. The community is split once again on the same race lines as a half century earlier. The young Lindsay agrees to sit in on the case, facing head on the same prejudices as his grandfather. In the end, justice is served and the innocent and guilty are proven. Young Lindsay also discovers the truth behind his grandfather’s disappearance in 1964. The town of Justice has scars, and it is hoped that the solution to the mystery and the proven innocence of the various parties will heal those old wounds. Ace Collins has taken an issue that continues to threaten our nation and thrust it directly in our faces. Racism is just as prevalent today as it was fifty years ago. The issue today is also exacerbated by the new dogma of “Guilt before Innocence,” jumping to conclusions, and premature conviction in the Court of Public Opinion. The story by Collins reminds us that we would be far better off to get all the information before speculation. The characters in this book were very realistic. Coop Lindsay seemed torn between doing the right thing and just giving up for the sake of his family. In the end, his upbringing as a preacher’s son chose the path his conscience demanded. Calvin, the accused murderer in 1964 had a deeply embedded distrust of the white people in Justice. Even though Lindsay was trying to help him, he was very standoffish and took quite awhile to trust the attorney. The same traits could apply to the modern attorney and suspect, respectively. 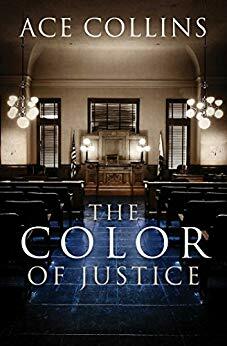 The Color of Justice by Ace Collins was a great book. It made me think about our justice system and how difficult it must be for lawyers, judges, and suspects to wade through the constant barrage of public opinion to arrive at the truth and deliver the correct verdict. It doesn’t always work, but it is not for a lack of effort from the various parties. It is a face-paced novel that grabs the reader and makes he or she evaluate the way they look at the world around them. Craig Bacon is not a proponent of racism, but he is a proponent of enlightening literature.